The day has arrived, and the smell of fresh ink wafts upwards as I open the NEW BOOK! My latest labor of love, Four Corners USA, has been officially published. Its real and tangible. The finish line has been crossed. And now its another bright day to launch a new book. 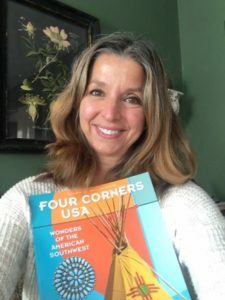 Four Corners USA is a loving tribute to the beauty, history, and cultures of the American Southwest. The photographs and text explore the special region where Colorado, Utah, Arizona, and New Mexico all come together. 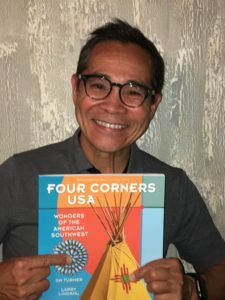 Four Corners USA is now officially released by Rio Nuevo Publishers (Tucson, Arizona), publishers Ross Humphreys and Susan Lowell, editor Aaron Downey, writer Jim Turner, and photography by Larry Lindahl. The cover and layouts are the work of award-winning book designer David Jenney. That’s the team. Captured between the book covers is the inspiration for an intriguing experience. If every picture is worth a thousand words, then the photographs throughout the book along with the in-depth text make this an encyclopedia about the region. The facts and figures support the deeper stories of exploration while delving into the mysterious and stunning American Southwest. The Southwest is full of beauty woven with magic into a richly colorful tapestry covering this region’s geography. 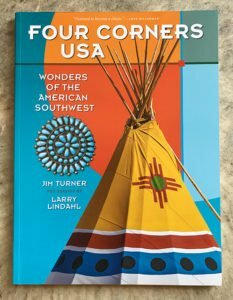 Four Corners USA books are available from my Larry Lindahl web site store, a bookstore near you (support a local business), and/or Amazon. Already people in Hollywood are talking about movie deals, television documentaries, and a show at the Getty. I’m purely fantasizing all of that. But glad to see you were still reading! Thank you Dianne Barone, formerly of the Weather Channel, and Manny Amit, ABC television network art director, for standing in for the Hollywood movie producers I was mentioning earlier.